The original plans have long since gone but thanks to a nine month study undertaken by a North East Architect and Visualiser the ’BECO Building Site’ has been digitally reconstructed to offer you a unique insight into televisions most famous construction site. View the site plan in context with its residential backdrop along with key set buildings including the Admin Hut, the Turks Hut and home of the Magnificent 7; Hut B! The magic of television editing convinces the viewer the ‘BECO Building Site’ was a large construction site in Dusseldorf, Germany. In fact, most of the construction site scenes were filmed on a purpose built film set in the UK on a small 2 acre backlot at Elstree Studios, Borehamwood. Find out where it was filmed, and what it looks like today and discover how the magic of television convinces the viewer our Magnificent 7 were far from British soil. We bring you all 13 Series 1 Episode Guides in detail pinpointing the precise location of every scene, location and direction filmed at Elstree Studios back lot. Find out where Barry and Moxey constructed their herb garden, where Dennis and Bomber caught sight of the biggest rat they’d ever seen, where Wayne first lay eyes on Tracy, where Oz narrowly missed falling scafolding and where Neville discovered that bomb to save the day! Welcome to BECOBUILDING.SITE a ‘Site’ to be ‘Scene’! Below you’ll find everything you ever wanted to know and more about televisions most famous construction site; Auf Wiedersehen, Pet’s ‘BECO Building Site’! Discover the most comprehensive collection of digitally reproduced site plans and aerial views of the film set including artists impressions, detailed episode guides, facts, trivia and so much more. Over the coming months, we’ll be bringing you the ultimate three-dimensional virtual tour of the film set we’ve grown to love for over 30 years allowing you to retrace the foot steps of our very own ‘Magnificent 7’; Oz, Dennis, Neville, Bomber, Wayne, Barry and Moxey. The ‘BECO Building Site’ really is a ‘Site to be Scene’. Scroll down and discover at your leisure... but beware... things aren’t always what they seem at BECO! “DEAREST BRENDA, WE ARE NOW AT SEA…” Our brand-new signature series tee-shirt features the very first words of series 1, episode 1 uttered by Geordie Neville Hope encompassing the essence of an adventure to destinations unknown in hope of a better future. This new addition perfectly complements our range and is digitally screen printed in white to the highest standards on light blue heavy cotton with classic red and white logo to the sleeve. WHO’S LOTTE? 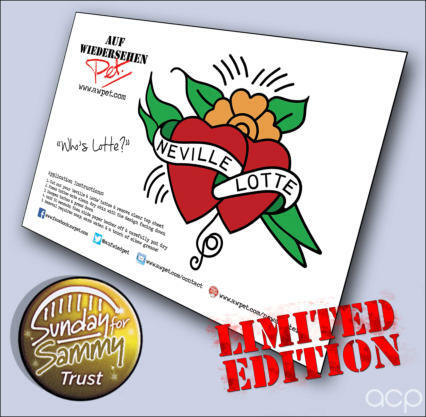 What’s more, why not grab a Limited Edition ‘Neville & Lotte’ temporary tattoo to accompany your Neville Signature tee shirt? Available in the Official Auf Wiedersehen, Pet shop now whilst stocks last! Below you’ll find everything you ever wanted to know and more about televisions most famous construction site; Auf Wiedersehen, Pet’s ‘BECO Building Site’! Discover the most comprehensive collection of digitally reproduced site plans and aerial views of the film set including artists impressions, detailed episode guides, facts, trivia and so much more. Over the coming months, we’ll be bringing you the ultimate three-dimensional virtual tour of the film set we’ve grown to love for over 30 years allowing you to retrace the foot steps of our very own ‘Magnificent 7’; Oz, Dennis, Neville, Bomber, Wayne, Barry and Moxey. The ‘BECO Building Site’ really is a ‘Sight to be Scene’. “DEAREST BRENDA, WE ARE NOW AT SEA…” Our brand-new signature series tee-shirt features the very first words of series 1, episode 1 uttered by Geordie Neville Hope encompassing the essence of an adventure to destinations unknown in hope of a better future. This new addition perfectly complements our range and is digitally screen printed in white to the highest standards on light blue heavy cotton with classic red and white logo to the sleeve. WHO’S LOTTE? What’s more, why not grab a Limited Edition ‘Neville & Lotte’ temporary tattoo to accompany your Neville Signature tee shirt? Available in the Official Auf Wiedersehen, Pet shop now whilst stocks last! a ‘Site’ to be ‘Scene’!